PanARMENIAN.Net - The greatest masters of surrealism never missed an opportunity to cite their own unconscious as an inspiration for their work. The real, conscious experience, inspired by a particular source, always poses a risk of copying others' works, with only the subconscious perception capable of making a creation unique. Colors, shades and lines whose gravitational force is felt even at the level of instincts: artist Arax Sargsyan is well aware of the art of revealing the entire spectrum of emotions of the human subconscious. Her works are flexible, lush and panoramic, even when the author uses graphics both as a basic tool and as a means of expression. 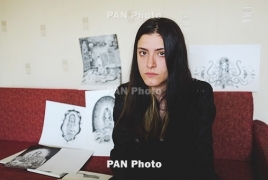 In a conversation with PanARMENIAN.Net Sargsyan told about the fairy tales she read as a child, later filtering them through her subconscious and developing a style of her own. One can’t take eyes off your paintings. They have some magical, fascinating power. I guess you have to conquer an immensely unique path to convey such energy to the paintings. I began my journey at the age of 11, when I entered the National Center of Aesthetics,starting painting in Vahagn Baghdasaryan's group. When he asked me to draw something, I painted a dragon, and he went along with my preferences, putting no restrictions throughout the course. Moreover, noticing my potential, the center further encouraged me and offered relevant materials. And this is how my artistic activity began. But if we look deeper, my journey began in my distant childhood, when, at the age of three, I started reading Grimm Brothers' fairy tales, as well as French and Scandinavian legends in their original language. In fact, contrary to established stereotypes, those works were pretty grim and had their dark sides which, perhaps, came to form the basis of my worldview. After getting my BA in decorative-applied art, the main direction of my work was finally shaped. Formally, themes can be divided into two main directions – genres of fantasy and horror – which, however, often mingle. I mainly work in graphics which is broader and more compelling compared to oil paintings or digital art. There are, of course, a slew of sources of inspiration, starting from literature and movies to separate individuals. But finding inspiration from a specific work is just the beginning. You then have to find out which traits of that particular work stunned you. And only after this revelation can you adopt those features. This often happens subconsciously. How can the object of conscious inspiration which can at that moment arouse enthusiasm and admiration, later serve as a basis for your own work? Inspiration can be found anywhere – irrespective of whether that’s a book, a movie or a painting. The first step is conscious: you seek to compete with the author of the object of your inspiration in some sense. But that should never be expressed in the form of copying. You may put the pencil aside, and after a while, when unconsciously “doodling” on the paper, a random line will appear that will further develop into a unique work of art. Only after completing the work you understand that it is the result of you inspiration – “absorbed” and filtered through the prism of subconscious. If a work is at least partially born in the subconscious, then it is entirely yours. Every single piece is derived from a specific experience. What was it that served as an inspiration in your creative path? It is difficult to single out now, but I guess “Alice's Adventures in Wonderland” by Lewis Carroll has come to serve as such a source for me. Not only has the book led to creation of a separate series, but it has also become “a desk book” which I every so often read and perceive each time differently. Carroll’s “literary symmetry” is often reflected in my work one way or another. I know you’ve held exhibitions at different times, also collaborating with Laika Entertainment. My series of works of 2011-2012 was nominated for a Presidential award. In the framework of collaboration with some cool people from Laika Entertainment, our first joint exhibition was held, followed by a second one in Portland, Oregon.The exhibitions were organized through the collaboration with and support of Ben Adams an artist who works at the animation company Laika and has worked on films like Coraline, Para Norman, Boxtrolls and Kubo which comes out this Summer. We are planning to collaborate on another project too in the form of illustrating a graphic novel or a book, but the topic is still unknown.